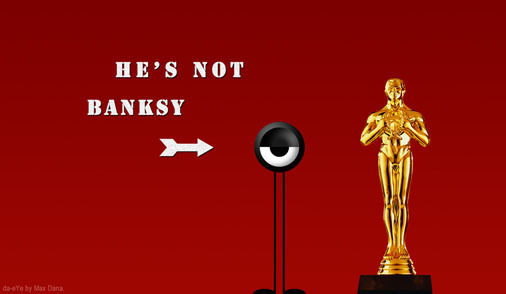 No one showed in a monkey mask at the Oscars. Many people were hoping ‘anonymous’ British street artist Banksy would show last night (his film ‘Exit Through The Gift Shop‘ was nominated for Best Documentary Feature) but he didn’t. Or maybe he was there and we didn’t recognize him. But apparently, someone bombed the wall behind da-eYe to avoid any ambiguity, telling us ‘He’s not Banksy’, the arrow pointing at da-eYe’s head. No Banksy then but our one-eyed guy enjoyed the after parties. A lot. No pictures available, sorry! (In fact, we are not ‘sorry’. It’s all about decency here). Click on the picture below for larger size.